The mothers of the Jewish suspects being interrogated in the lethal Duma arson wrote a letter on Tuesday night to Shira Alsheich, wife of the police commissioner, as well as Osnat Cohen, wife of the head of the Israeli Security Agency (ISA). In the letter the mothers addressed the two women as mothers, asking them to take action against the alleged torture being suffered by their sons under the interrogation that has already lasted roughly a month. "In recent weeks our dear sons, some of them minors, were cruelly tortured in the basements of the Shabak (ISA)," wrote the concerned mothers. "For a long period they were prevented from meeting lawyers." "The method of the investigation, the violence and the torture that our children described before the courts and lawyers, keep us awake at night. Three youths still haven't met a lawyer, and it is hard to know what is happening to them in these hours." The mothers raised concerns over the long-term effects of the interrogation, saying, "it isn't clear to us whether we will get the same children back who were taken from us by the police and the Shabak, or whether the result of the cruel acts against them will be that their souls and bodies are harmed forever." "This cruel punishment, without trial and amid a decision to erase the personalities of our children (in a media gag order - ed.) and extract a 'confession' from them at any price, is a heartbreaking injustice. We hope that this is not being done due to their external appearance (they have peot and large kippahs), as a part of the difficulty among certain establishments in accepting the other." In conclusion, the mothers told the two women they hope their letter will move them so that they help the families of the suspects in "reaching the hearts" of their husbands, the heads of the police and the ISA, "to try and correct this injustice." They asked the two women to be in touch with them to help prevent the alleged torture from continuing. 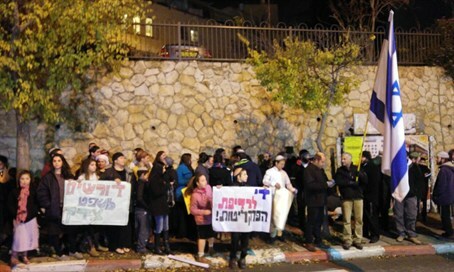 Nightly protests against the reported torture are set to continue on Tuesday night, with activists of the "Jews don't torture Jews" group anticipated to demonstrate in front of Jewish Home chairperson Naftali Bennett's home in Ra'anana over his backing of the ISA, as well as in front of the home of ISA head Yoram Cohen in Jerusalem. Earlier on Tuesday the Lod District Court ordered to release one of the Jewish suspects to house arrest. After being held for 29 days police asked to extend his arrest based on alleged involvement in an unrelated quarrel with Bedouin shepherds two years ago, in a request thrown out by the court. However, the Honenu legal aid organization representing the suspects reported the Israel Prison Services (IPS) are refusing the order to release him, as State Attorney Shai Nitzan had a request issued to have the release delayed while submitting a petition. The group argues the delay is illegal. One minor suspect in the case broke down and confessed last week after nearly a month of interrogation, but the reported torture raises concerns that the confession may have been false and inadmissible as evidence. Prior to the confession, officials admitted there was no evidence against the suspects.